Size:Small:(L)8.7"*(H)4.3"*(W)5.1" Medium:(L)10.2"*(W)5.7"*(H)5.9" Large:(L)11.8"*(W)6.3"*(H)6.3 Multi-Pocket Handbag Organizer fulfill all your needs, 1 large pockets, 8 liner pockets, 2 Outside pocket. Light weight and Sturdy. Portable and compact. Keep your Handbag shape and neat. Material: High Quality Felt, Light-weight, Very Sturdy. 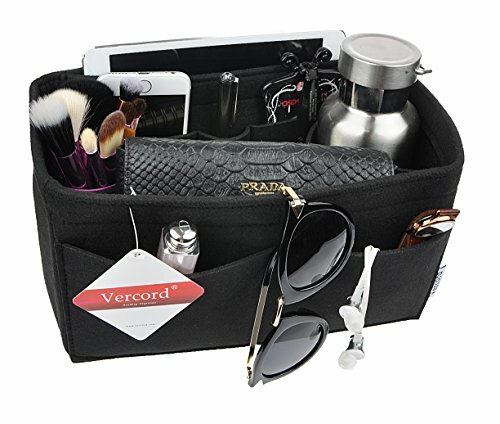 Multi-Pocket Handbag Organizer fulfill all your needs, 1 large pocket, 8 liner pockets, 2 outside pockets. Excellent organizer bag for your world wide tour. Perfect for Travel, Home, Outdoor and indoor use, bag in bag. Vercord's own Trademark, we provide 100% SATISFACTION GURANTEED. Vercord is the manufacturer and the only seller of this product. We never authorized any other seller to sell Vercord products. Vercord will NOT be responsible for orders from other sellers. JUST BUY from the seller "Vercord",we aslo have many other goods for this brand, you can serch our brand "Vercord"on amazon website. If you have any questions about this product by Vercord, contact us by completing and submitting the form below. If you are looking for a specif part number, please include it with your message.